Bergmann, I., von der Heidt, T. and Maller, C. (2010). Cognitive dissonance and individuals’ response strategies as a basis for audience segmentation in social marketing to reduce factory farmed meat consumption. 2010 International Nonprofit & Social Marketing Conference (INSM) – Connecting Thought and Action, Queensland University of Technology and Griffith University, Brisbane, QLD, Australia, 15.-16. July, Conference Proceedings, pp.32-34. Motivations for maintaining meat consumption are strong, extremely varied and complex. It is therefore difficult to develop marketing strategies for the reduction of meat consumption that are relevant for all consumers. In this paper we propose an audience segmentation to devise marketing strategies that address consumer groups of similar motivation. The phenomenon of cognitive dissonance (CD) is suggested as a conceptual device to develop such an audience segmentation. CD is an uncomfortable and unsettling feeling that arises when conflicting ideas or ideas and behaviour occur simultaneously. Humans try to avoid CD by adjusting their behaviours, attitudes and beliefs, by rationalising and justifying them or by actively avoiding situations or information that increase CD (Festinger 1957). CD is a feeling that arises for most because most people express concern about animal welfare and harm done to animals but continue to consume meat. Choices in terms of purchasing, preparing and consuming meat are nested within the habits and routines of day-to-day practices. Such choices and behaviours are facilitated by the structures of the production and supply system, as well as being guided by social and cultural norms, habits, assumptions and expectations. 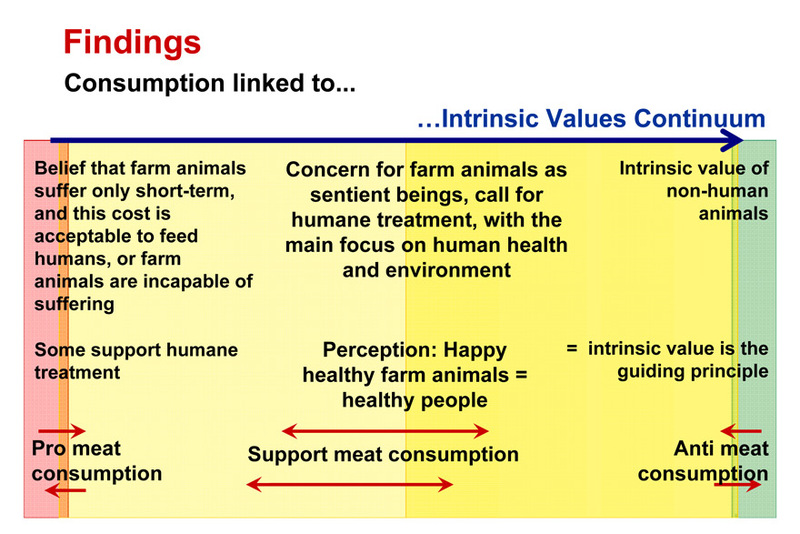 One way of breaking the above connections and leverage the arousal of CD is to address the belief in the intrinsic value of non-human animals described here as the “Intrinsic Values Continuum”. The underlying motivation for an individual’s meat consumption behaviour is largely determined by their position on this continuum. As such, three main audience segments can be distinguished. Firstly, at one extreme are individuals who display strong pro-meat consumption views and who have resolved their CD by rationalising that animals will only suffer for a short time or are incapable of suffering at all. If suffering is acknowledged, then it is argued that this cost is acceptable to feed humans. Some amongst this group do support more humane treatment of farm animals. At the other extreme of the continuum is the group of individuals (including vegetarians and vegans) who have resolved their CD by acknowledging the inherent value of animals and use it as their guiding principle. It includes also those who continue to battle with CD and with competing response strategies. Individuals in this group undertake the greatest effort of all to reflect their attitudes and values in their consumption behaviour. Actions at the practical level generally supported by participants of this study include the provision and easy access to information to address knowledge gaps, increase in the availability and variety of meat alternatives, advancing the discussion on what constitutes “humane”, legal requirement to implement humane farming practices, support for small-scale farming, including near and within urban areas, consumer-producer cooperatives and more farmers markets, regulated food labelling and the elimination of misleading terminology. 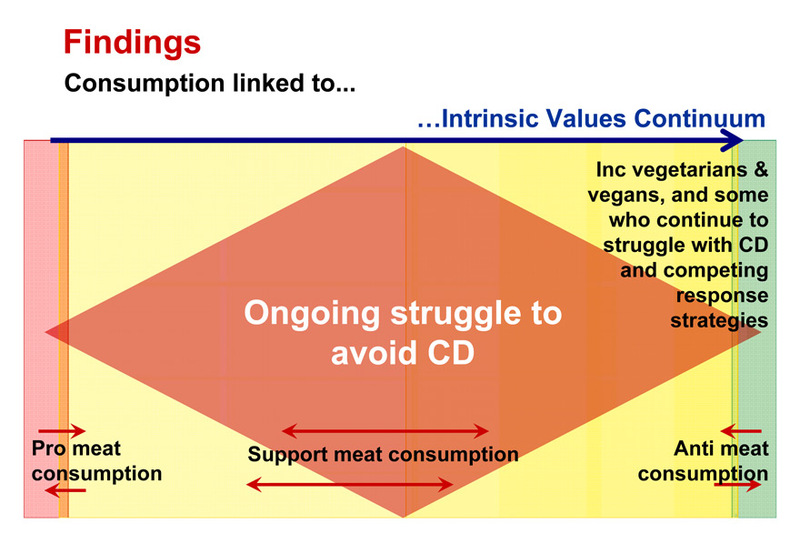 The discomfort of CD in the context of meat consumption primes individuals for behaviour change. Providing information to address incomplete knowledge and alternative conceptions is an important strategy, however, more often than not this alone will not lead to behaviour change. 1. Further audience segmentation, in particular of the largest group along the centre of the continuum, is required to be able to develop targetted strategies to better address all groups of consumers. 2. Strategies to embed the intrinsic values of non-human animals within the population need to be developed. 3. Social marketing strategies need to employ a whole of systems stakeholder approach, including not only the consumers but also regulatory bodies, retailers, producers, service providers and the media.